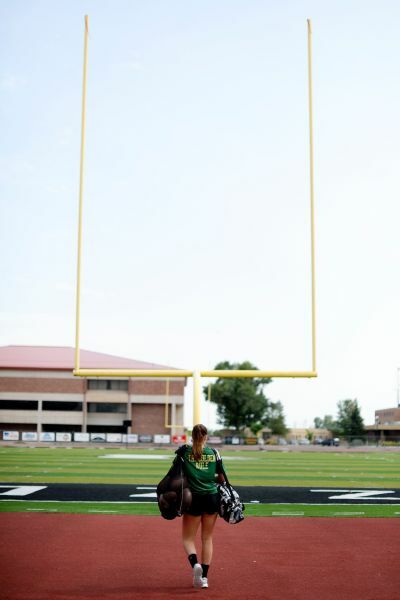 Kicker Becca Longo is competing for a starting position at Adams State. But the scholarship player is not out to prove the doubters wrong. She's just playing the game she loves. Becca Longo places a football on the turf near the 20-yard line. She takes a few steps back and then to the side, positioning her right foot -- a lime cleat with a splash of orange -- farthest away from the ball. With both arms by her side, she gently wiggles her right arm, shedding lingering nerves and doubts. Longo is alone on the field at Adams State, a Division II school in Alamosa, Colorado, a sleepy city of 10,000 about four hours south of Denver. The 5-foot-11, 140-pound freshman kicker is the lone woman on the Grizzlies' 94-player roster. She's also the first woman to earn a football scholarship at a Division I or II school. But on this Thursday in early August at Rex Field, the only thing that matters is how high and how far she can make that football soar. She takes a deep breath and looks up at the sky, scanning for a cloud. There are plenty: giant, doughy streaks breaking free of the never-ending blue, hovering so low it looks like they could take a bite out of the San Luis Valley flatland. Morning rain and thunder almost threatened to keep Longo from kicking today, but the weather didn't stand a chance. Not much does. Last week, she hopped the field's 7-foot gate to retrieve a ball, which left her with an inch-long gash on the palm of her right hand. She sprinted back to the field and continued to kick as the ruby-red stain pulsed. I don't always have to prove myself -- but I always want to. Head down, follow through. The Chandler, Arizona, native whispers those words from her father, Bob, as she launches a kick that sails through the uprights. She misses just three during the 30-minute session. But Longo, who is money from 35 yards and in and who drilled a 54-yarder in July, frowns. She expects herself to make every kick. Her eyes circle back to the clouds. She envisions Wonder Woman (she saw the movie seven times) lying helpless on the ground, struggling to fight Ares, the god of war. When the plane, flown by Wonder Woman's love interest, Steve Trevor, explodes in the clouds, Wonder Woman summons new strength, shooting an energy beam to wipe out Ares. A bolt of energy shoots through Longo's own body. She strikes the ball forcefully, elegantly, and it's good. "A lot of people think, 'Aw. She's a girl. She can't do this. She's not strong enough, she's not big enough,' " Longo says. "I think it's just something inside of me. I don't always have to prove myself -- but I always want to." Becca Longo does lunges to Future and The Weeknd's "Low Life," and she fesses up to feeling like Beyonce on the football field. Later that day, Longo and 42 teammates huddle in the weight room for the last leg day of the summer. "It's a Vibe" by 2 Chainz blasts while players grind through sets. Shirts are soaked with sweat. Hamstrings feel like ripping apart. Longo leg-presses 180 pounds (normally she does 360) and charges through box jumps. "I'm about to come out looking like Ronda Rousey's worst nightmare after my time here," she says, flashing a smile, going 45 minutes without a drop of water. "She doesn't take reps off," says senior cornerback Tim Brown Jr.
She can't. Not when she's battling two other kickers, freshman Tiago Paim and sophomore Montana Gomez, for the starting job. The Grizzlies, who went 2-8 in 2016, kick off on Sept. 2 against Black Hills State University. Longo clutches 25-pound dumbbells for lunges. Senior quarterback Jorge Hernandez does the same. Future and The Weeknd's "Low Life" comes on, and the two shimmy their shoulders while singing: "Reppin' for that low life ... low life, low life, low life ..." It's a brief but blissful exchange for Longo. Here, the guys don't view her as The Female Kicker. She's just No. 45. She's just "Longo." "She gets after it just like all of us," Hernandez says. "She's not just here to be on the team. She's here to play." Longo, who converted 35 of 38 extra point attempts and made her lone field goal attempt (30 yards) as a senior for Basha High School (Chandler, Arizona) in 2016, doesn't back down. Not even from Grizzlies head coach Timm Rosenbach, a former NFL player. "All right, guys!" he said last week, huddling up the team, "... and girl!" Longo knew he was just trying to be inclusive, but she wasn't having it. 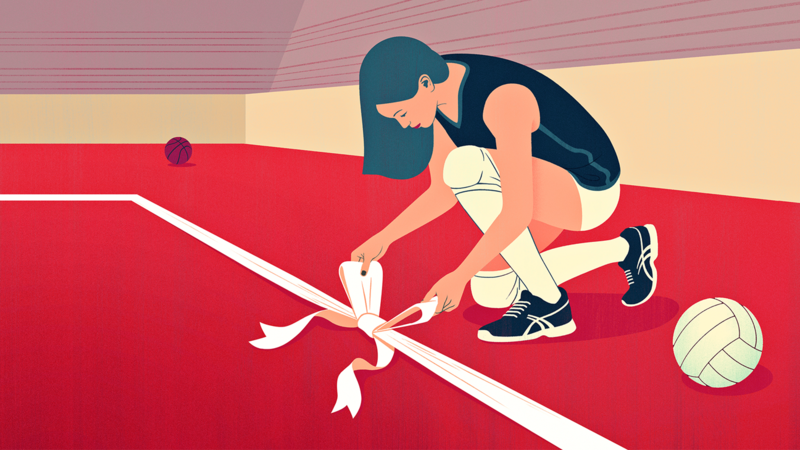 "Coach," she said in front of everyone, "You don't have to say 'girl.' It's fine." It didn't happen again. 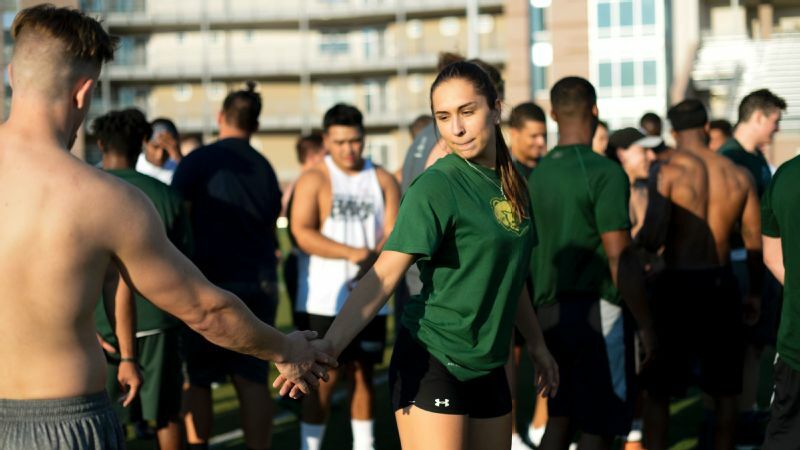 Quarterback Jorge Hernandez, right, knows Becca Longo is out to land more than just a roster spot at Adams State. Once, after an extra point against Higley High (Gilbert, Arizona), she was hit by a player coming from her right side. He was shocked at the sight of her long hair flowing under her helmet, her eyeliner black and bright as the night sky. Longo shoved him back. "I felt like Beyoncé." Longo, who also will play basketball for Adams State, once went toe-to-toe with a Casa Grande Union High shooting guard as both rained 3s back and forth. Longo had the chutzpah to point her finger at the girl, as if to taunt: "Come here." The player motioned for everyone to clear out, but air-balled as Longo's defense smothered her. I'm about to come out looking like Ronda Rousey's worst nightmare. That's Longo: wanting to be everything and everywhere. A wide receiver? She once snagged an epic one-handed catch, calling herself "Odell Becca Jr." A painter? She composed a turquoise watercolor sea horse and sea turtle in July. Interior decorator? She themed her dorm room "Beach," complete with a starfish, Tahiti Island Dream shower gel, a turtle-shaped jar and even a real-life beta fish named George. Expectations are high for the 18-year-old. "She's already shown that she's got the grit and determination to push through and make it at this level," says Katie Hnida, the former Colorado and New Mexico kicker who became the first woman to play, and score points, in an NCAA Division I football game. But the pressure mounts. Longo was on ABC's "Good Morning America." She had 18 interviews in one day. 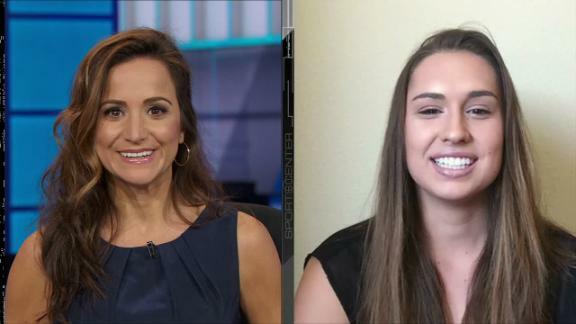 She's asked about becoming the NFL's first female kicker, despite having zero interest in turning pro. She can't go to the local fair without getting recognized (luckily her friend Abi turns away autograph-seekers by pretending Longo's name is Emily). "All right now," Rosenbach told Longo. "Nobody cares who you are until you make a kick." Longo laughed, then grew quiet. She stiffened her lip. "You're right." Becca Longo converted 35 of 38 extra point attempts and made her lone field goal attempt (30 yards) as a senior for Basha. Something compelled Longo to the field one day after class toward the end of her freshman year at Arizona's Queen Creek High School. The football team was practicing. There weren't any girls out there, so why not her? She had a powerful leg, too, from years of soccer (and basketball, baseball, Frisbee. Heck, she even stood up on water skis for the first time at age 4). She told the athletic director she'd be trying out for football. He laughed. "I felt like he doubted me," Longo says. "I completely shocked him when I went out and did it." Her brother Bobby, 11 years older, wasn't shocked. As kids, the two would throw a football to each other as hard and as far as possible while swimming in Lake Pleasant in Phoenix. Once, Bobby threw the ball at her back when she wasn't looking. Longo zoomed through the water so fast you'd think she sprouted fins. She smacked Bobby so hard his back turned red. "She left a mark," Bobby says. New year, new stars. We've singled out some impact freshmen you're going to hear a lot about this school year. 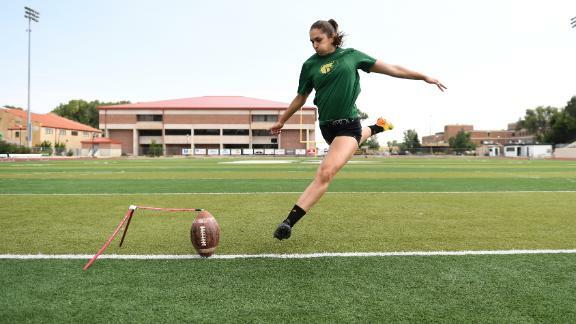 As a sophomore, she met Alex Zendejas, who has coached seven all-state kickers in Arizona since 2006; four of his family members have kicked in the NFL. Longo seemed to have natural talent. "I was amazed at how much power Becca had," says Zendejas, who became her mentor. They trained three times a week. "I thought something big was probably going to happen if she stuck to it." Zendejas has a rule that players end on one kick, make or miss. Longo didn't follow it. If she missed, she'd run and grab another ball and kick until she ended on a make. But hours before her first game on junior varsity in 2014? Longo wished to disappear. She ducked down against her seat on the team bus, shielding her phone (and the tears streaming down her cheek) as she sobbed to her mom, Andrea: "I can't do this. I'm going to throw up." Too late. The bus pulled up to Poston Butte High. Crisis No. 1? Finding a girl's restroom. Three girls spotted her. "Are you Becca Longo?! Oh my gosh, it's her! The girl football player!" They escorted her to the restroom, bringing 10 more girls. Then 10 more. Soon a line for photos crowded around Longo's stall, asking for photos with her. Longo hadn't even washed her hands. Just like that, Poston Butte kicked off the ball to Queen Creek, which ran it back for a touchdown. No time to run away. Longo rushed to the field for the extra point attempt, her leg shaking so much she couldn't feel it. Even her dad's hand wobbled as he held up his camera. "Braxton!" Longo screamed to her holder. "I can't do this! Run it in!" "Becca, just kick the ball!" She did. Every muscle in her body tingled. The crowd exploded. The guys tapped her on her helmet. The moment was so sweet and so sudden she almost blacked out. Longo soon transferred to Basha, which was coached by Gerald Todd. Todd's brother, Everett, who is now the defensive coordinator at Grambling State, had coached Hnida while an assistant coach at New Mexico. "How do you coach a girl?" Gerald asked Everett. "Man, I don't coach girls," Everett said. "I coach football players." Gerald had Longo kick in front of the entire squad her first week of spring varsity practice. Her misses would determine the number of sprints to run. She started at 17 yards, backing up 5 after each make. She reached 32. Boom! Then 37. Boom! Then 42. "There's no way," Gerald said. She missed, but he was so impressed he let her try again. Boom! The boys jumped and screamed and embraced her. "That was the moment that everybody just bought into Becca," Gerald says. She earned the starting nod. She ignored nasty comments from some opponents. All that mattered was her teammates had her back. "They respected me because I did everything they did," Longo says. "And then some." To coach Timm Rosenbach and the rest of the Adams State football program, Becca Longo is just another player. "She's going to get drilled by a 300-pound lineman." "She's going to get her neck snapped." "She's just a publicity stunt." "She's going to die on the field." Longo ignores the daily tweets that come her way. "If they want to think that, they can think that," she says. "Then I'm just going to kick a game-winning, 55-yard field goal ... see how loud they are then." 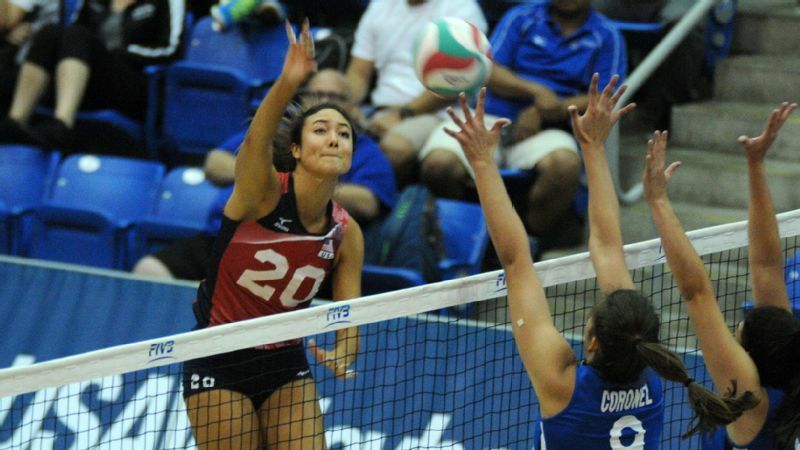 Becca Longo already has been both a target and an inspiration. 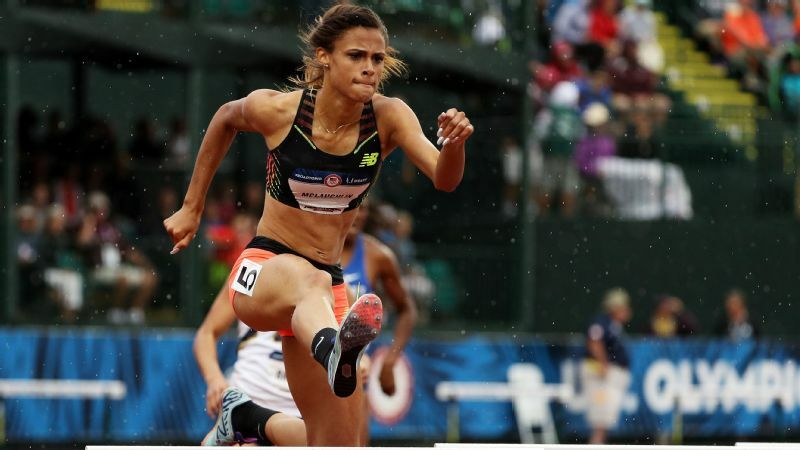 "I've been doubted in everything I've done," she says. "Being mentally strong is the only defensive mechanism I have." Few expected her to play college ball at all. Adams State hadn't even intended to give her a scholarship. Offensive coordinator Josh Blankenship had heard there was a girl in Arizona who was accurate, powerful, disciplined. He went to Basha to meet her, eventually inviting her to campus for a tryout, which is permissible in Division II. She went 23-for-25 during the February tryout, fantastic for anyone unless your name is Becca Longo. The two misses pierced her. 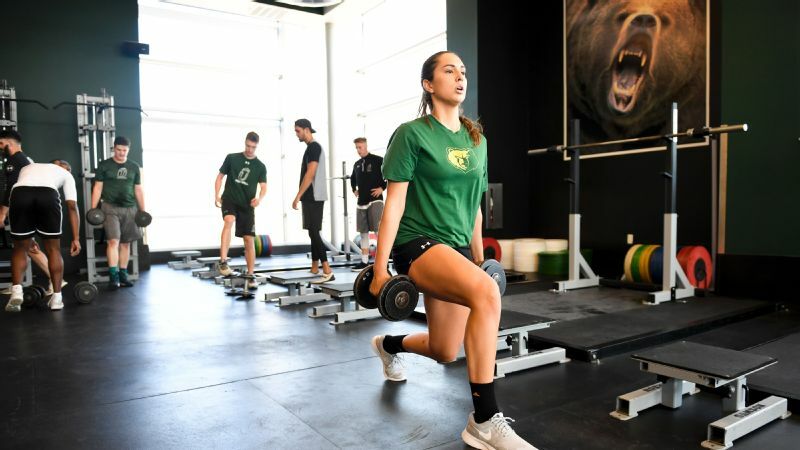 "She puts more pressure on herself than any of us could ever do," says Ross Brunelle, the special-teams coordinator who conducted the workout. She criticized herself for not getting height on the ball, for not following through, for having her plant foot too far from the ball. "I liked that she felt that way," says Rosenbach, who secretly watched the session. "If you can feel that way, you're a competitor." Bottom line: Rosenbach needed someone automatic from 35 and in; Longo was it. "I don't care if the player's a martian. You're going to recruit that player," he says. "The gender part wasn't really a factor to me." After signing her letter of intent, Longo thought of Rudolph the Red-Nosed Reindeer. Every Christmas as a kid she'd belt out: "You'll go down in historrrryyyyyyyyyy," telling her mom some day she would. She beamed on signing day in April reading the headline: "Becca Longo is going down in history." Her Instagram was flooded with comments, mostly from little girls. "I'm going to play football just like you." "All seven of my daughters look up to you." "That's her favorite part: the little girls," mom Andrea says. "There are so many little girls following her, recognizing, 'I can do this. She did this, I can do this, too.' "
Back in the weight room with the guys, Longo prepares for a lying hip bridge walkout -- which is, in her eyes, torture; it makes her hamstrings feel like they're busting out of her legs. But no one can know she feels like collapsing, that her legs are shot from kicking and playing pickup hoops earlier. She lies on the ground and stares at the ceiling, as if contemplating her two options: buck up or break down. She thrusts her hips up, forming a bridge, then moves her legs out in small, choppy steps until they are fully straight. She holds the position for five grueling seconds, clenching her teeth tighter to avoid wincing. She moves her legs back in small, choppy steps until she returns to her original position. Rest. Another set. Rest. Another set. Done. Pulling herself off the ground, Longo turns around and notices a faint squiggle of sweat soaking into the surface. It sort of looks like an "L." She smiles quietly to herself before quickly resuming a poker face. She heads toward the door, her biceps bulging as she clutches a ball. What will Wonder Woman do next?